When the State of Israel officially declared its independence in May 1948, the fledgling state was in need of an official emblem to demonstrate its sovereignty in the community of nations. In the process of designing the emblem, many proposals which sought to include the symbols deemed appropriate for representing the Jewish people in their reborn state were reviewed. To avoid imitating the emblems of European countries and to create a unique one, ancient visual symbols from former periods of Jewish sovereignty were sought. 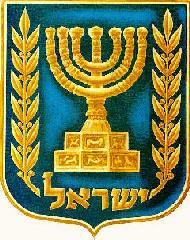 Much importance was attached to symbolizing the continuity and fulfillment of the Zionist dream in the emblem of Israel. Whereas the flag had been created in the Diaspora, by dreamers, the emblem was designed in Israel, by those who had realized the dream. Because it had to incorporate elements of symbolic meaning, the designers felt a heavy sense of mission and responsibility. The design process was long, as two almost antithetical forces tried to dictate the character of the emblem - religious and ritual values, on the one hand - secular and sovereign norms, on the other. The emphasis moved from "camp" to "camp" until the final design of the emblem was determined. The Provisional Council of State announced a competition to design the emblem of the State. The proposal submitted by graphic artists Oteh Walisch and W. Struski was chosen out of 450 designs submitted by 164 participants. The seven branched-candelabrum of the Temple - the menorah - occupies the center of the Walisch and Struski seal. The candelabrum is undoubtedly the oldest Jewish symbol. It has no parallel in heraldry and produces an immediate association with the subject it represents - the Temple in Jerusalem. The artists took as their model the depiction of the menorah in relief on the Arch of Titus in Rome. They simplified the shape into a sort of schematic negative in white, displayed against a light-blue background. The upper portion of the emblem showed a white band, on which the seven golden stars are emblazoned, which Theodor Herzl had intended for the flag of the Jewish state. He had meant these stars to stand for the seven-hour work-day he envisioned for the future citizens of the Jewish state. Had the Provisional Council of State adopted the design submitted by Walisch and Struski, the emblem of the State of Israel would have embodied the Jewish people's irrevocable affiliation with its glorious past in the homeland (the menorah) along with the revival of that past in the light of Herzl's modern liberal ideas (the stars). But the proposal was not accepted. A special "Emblem and Flag Committee" was set up to deal with new proposals; it was headed by Beba Idelson and its members included cabinet ministers and members of the Knesset. The committee decided that the seven-branched menorah should be one of the elements of the emblem, but each member had his own ideas as to what other elements, e.g. candles or the "Lion of Judah," should be included. Transport Minister David Remez suggested that experts in various fields, be included in the committee. Thus, Aba Elhanani (architect), Eliezer Sukenik (archeologist), Reuven Rubin (painter) and Leopold Krakauer (architect-artist) joined the committee. One of the new proposals submitted to the Emblem and Flag Committee was rendered by graphic artists Itamar David and Yerachmiel Schechter. David and Schechter supplemented the familiar menorah and seven stars with the inscription Shalom al Yisrael (Peace over Israel) and stylized depictions of a palm frond (lulav) and a ram's horn (shofar). They also altered the shape of the emblem, to an ellipse. Another change was the model chosen for the menorah: depictions found on the mosaic floors of ancient synagogues in Eretz Israel rather than the relief on the Arch of Titus. In antiquity, the seven-branched candelabrum, a primary symbol of the Temple, appeared on coins, on decorated glass, in catacomb frescoes and on the walls and mosaic floors of synagogues. In these settings the menorah rarely appears alone; generally it is in the company of other ritual objects associated with the Temple - the censer, the ram's horn, the palm frond and citron, the last two associated with the Feast of Tabernacles (Sukkot), one of the festival celebrated at the Temple. These depictions of the Temple menorah are not consistent, so that it is impossible to be certain of its true form. They also differ from the accounts in the Bible, of Josephus and the Talmud, and it seems that the variation was intentional. Rather than reflecting a lack of artistic ability, the imprecision may point to a certain restraint and perhaps, even a prohibition against accurate depictions of the Temple and its appurtenances. The main difference between all the renderings of the menorah on the floors of ancient synagogues in Eretz Israel and that depicted on the Arch of Titus in Rome is the base; on the latter the seven branches of the candelabrum rest on a stepped polygonal base. Most of the former representations, by contrast, give the menorah a tripedal base. One familiar depiction of the three-legged menorah appears on the floor of the sixth-century synagogue in Jericho. Here the menorah is flanked by a ram's horn and plam frond and below it is the inscription Shalom al Yisrael ("Peace over Israel"). This was probably the source for the design submitted by David and Schechter, presumably chosen on the recommendation of Prof. Sukenik, one of the experts on the Emblem and Flag Committee, who had uncovered the Jericho mosaic in 1947. The inscription Shalom al Yisrael comes from the end of Psalm 125: Do good, O Lord, to the good, to the upright in heart. But those who in their crookedness act corruptly, let the Lord make them go the way of evildoers. Peace over Israel. The most significant change in the David and Schechter design is the change of the circular form (in the synagogue in Jericho) into an ellipse. Elliptical seals were common during the period of the monarchy. They generally bore the name of the owner (sometimes along with that of his father), plus a decorative element. The general message conveyed by the David and Schechter emblem may be summarized as follows: in addition to the link with the glorious past of the Jewish people in its homeland, with its ritual, religious and political aspects, the new State would be based on Herzl's modern secular liberalism, all accompanied by peaceful intentions. The struggle over the relative emphasis to be given to each aspect of the emblem was manifested in a variation on their original design, also submitted by David and Schechter at the request of members of the committee. The palm frond and ram's horn were missing from the modified proposal. The deletion of the palm frond and the ram's horn, leaving only the menorah and the inscription, created an emblem that still indicated Israel's peaceful intentions, but, by eliminating the association with ancient synagogues, left a more secular message. The proposals by David and Schechter, like Walisch's earlier design, were not accepted by the committee. After lengthy discussions, it was decided to invite new ideas for the emblem of the State. This time 131 persons responded to the notice in the press and most of the designs incorporated the menorah motif. Since the notice was addressed to the public at large, proposals came in from all over the country and from persons in all walks of life. Several supplemented the menorah and the seven stars with other motifs, limited only by the designer's imagination. Henry Raczkowski, for example, added a pair of doves, one on each side of the menorah. The base of his menorah doubled as that of the "scales of justice," which would guide the new state. A streamer across the top of the emblem bears Herzl's seven stars, three on either end and the seventh in the middle of the Hebrew inscription: Ki bitzedaka yikon kise (for the throne is established by righteousness [Proverbs 16:12]). Among the many proposals submitted during this round was one by the brothers Maxim and Gavriel Shamir. Beba Idelson presented their design to the members of the Seal and Flag Committee at its sixth meeting, on December 28, 1948. After we decided to use the menorah, we looked for another element and concluded that olive branches are the most beautiful expression of the Jewish people's love of peace. The leaves are also a very decorative element. Now we faced the question of which menorah to use... We decided on a stylized version rather than an ancient form. Our intention was to create a modern emblem, without Jewish traditional symbols. We told ourselves that the menorah itself is an ancient symbol and its very presence on the seal constitutes a traditional element. But its shape should be modern. (A. P., "How the Emblem of the State of Israel was Born," interview with the Shamir brothers, Ma'ariv, February 16, 1949). The Shamir brothers' menorah was so "modern" that the Emblem and Flag Committee, convened on January 10, 1949, was overcome by doubts at the "modernity" which they themselves had suggested. They did not like the stylized menorah and resolved that Beba Idelson, as suggested by Transport Minister David Remez, ask the Shamir brothers to prepare another design, using "Titus's menorah." Remez's return to this version added another level of symbolism to the menorah motif, one that had been absent from the earlier proposals: now the menorah would symbolize not only the grandeur of the past but also the present and, perhaps, the future. Borrowing the menorah from the Arch of Titus would constitute the visual metaphor of an idea prevalent in those years: just as the relief representing Titus's triumphal procession in Rome stood for the destruction of the Jewish state in 70 CE, so its rebirth would be symbolized by the return of the menorah - if not to the Temple - then to the newly born State of Israel. In other words, the menorah is returned from the Arch of Titus, where it symbolizes defeat, humiliation and disgrace, and is installed in a place of honor on the emblem of the State, the establishment of which is testimony to the eternity of the Jewish people. In this way, past, present and future are all linked in one symbolic motif. After the Shamir brothers incorporated the menorah from the Arch of Titus into their design for the emblem, the committee adopted it unanimously. Its chairperson, Beba Idelson, forwarded the proposal to the Provisional Council of State, which ratified it as the new emblem of the State of Israel. The emblem of the new state, adopted by unanimous vote of the Provisional Council of State, includes several ideas from the earlier designs (but omits one of them): the olive branches express the state's peaceful intentions; the menorah attests to the link of the Jewish people with its glorious past in the homeland and the return of the state to its former luster (through the metaphor of the restoration of the menorah from the Arch of Titus to its place in Israel), and indirectly, the beginning of the end of the Diaspora. "Israel" is the new name of the State, but the inscription is also a remnant of the phrase "Peace over Israel," which had been part of the earlier proposal. The element that was dropped was Herzl's seven stars. The emblem as we know it today clearly shows that in the struggle between the "secular camp," which wanted to emphasize the state's socialist and democratic present and future, and the "religious camp," which wished to stress the grandeur of the past and its link to the God of Israel, the former won. Yet this is also inaccurate. There existed graphic precedents for the combination of the menorah and olive branches and this was not the invention of the Shamir brothers. In fact, the combination may be traced to a specific text, one of the mystical visions of the Prophet Zechariah (Zechariah 4:1-3, 11-14). Thus, the emblem of the State that has become familiar to us borrowed Zechariah's vision to represent the Zionist idea of the newly established State of Israel. From this perspective, the establishment of the State corresponds to the rebuilding of the Temple in Jerusalem after the Return to Zion. The two olive trees evidently played an extremely important part in the perception of the new State, in which "religion" and "state" (the "two anointed dignitaries" - the high priest and the governor) stand together to realize the Zionist dream. The process of designing the emblem of the State, which began with the expression of a simple message, stressing the grandeur of the Jewish past as well as Herzl's notions of social progress, led to the creation of a much more complex emblem. This emblem projects a sophisticated and multi-faceted message based on verbal metaphors and visual and textual quotations. All of these are embodied in a few elements. The three visual elements - the menorah, the olive branches, and the inscription "Israel" - faithfully and with maximum brevity and directness, project the message conceived by the designers. Sources: Israeli Foreign Ministry; The author is an art histroian, art critic and a lecturer at the Open University of Israel.